Based on the hit Batman Movies "The Dark Knight". The Batman The Dark Knight Batman 1:12 Scale Action Figure is a must have for your Batman collection. 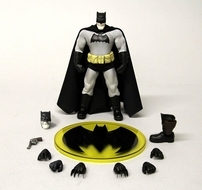 Batman comes fully loaded with accessories including a pistol, grappling hook, alternate head, and removable utility belt. You can display Batman on the Bat-symbol display base with the articulated figure stand for multiple dynamic figure poses and detachable cape-posing stand accessory. Very limited collectible.